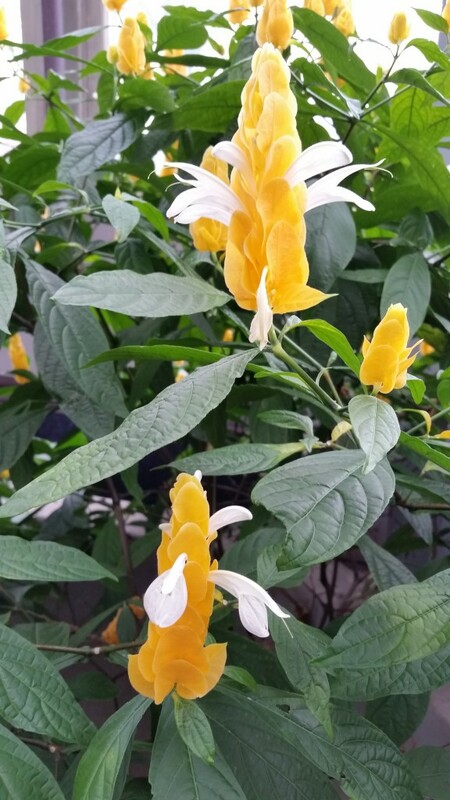 Pachystachys lutea, also known as lollipop plant or golden shrimp plant, is a great houseplant to add to your everblooming collection. It makes quite a showy bush with lush leaves. You can keep it small and in shape by pruning, or grow it out to a large specimen at 3 feet in a pot, more if planted in a greenhouse. This plant is a relative of the shrimp plant Justicia brandegeana, and just like it, has colorful, attractive bracts. It’s the bracts that are really the interesting aspect of the plant. The actual flowers emerge from the bracts and are small, white, and tubular. The lollipop plant is not a fussy plant, and does not require high light level to flower. It’s a very rewarding and reliable plant with lush tropical foliage. It’s easy to grow indoors and can be maintained at a medium or a larger size. Pachystachys lutea is not as drought tolerant as the regular shrimp plant, and does tend to soak up quite a bit of water during the warm months. Overall it has average watering needs. I would recommend letting the soil somewhat dry out between watering, especially during the winter months. If you accidentally dry out the plant, make sure you soak it in water and then drain the excess water well to ensure the soil is thoroughly moist. East/west or south windows are the best for this plant. Couple of hours of direct sunlight are ideal to keep the plant happy. They do tend to get leggy as they age, so a good light source and some pruning are essential to have a neat plant. I do take this plant out in the summer, and slowly acclimate it to higher light levels without any trouble. Pachystachys lutea likes higher humidity, and does like its leaves sprayed occasionally. Lower humidity levels will be tolerated, however the plant will be more susceptible to whiteflies, aphids and spider mites. Regular potting mix with a bit of extra per-lite to keep the soil from compacting to much. Pachystachys lutea is not very needy. A regular fertilized and occasional blooming fertilizer applied during the growing season (spring to fall) will keep the plant looking its best. Pachystachys lutea is very easy to propagate through cuttings. This is a great plant to have. It will brighten the dull winter months with its stricking yellow candle-like flowers. The flowers (by that I mean the bracts) are pretty large and showy. The lollipop plant makes a wonderful bush and can even be trained into a tree. Pruning it is very important (it flowers from the tips of the branches therefore you want a well branched plant), and form my experience this plant can take quite a hard pruning, returning to blooming in no time. Passiflora citrina is a cute passiflora vine. It’s relatively small, and though you can really grow it out (it’s a rapid grower), you can easily maintain it small and compact. The leaves have an interesting shape to them and have yellow stripes. The plat looks it’s best when you get the foliage dark and luscious, since the flowers are yellow. If there is not enough light, or the soil is not rich enough, the leaves will get lighter and yellower, and though you will still get plenty of flowers, they won’t be very noticeable. For best results, besides giving plenty of warmth, light, and fertilizer you can even add slow release iron supplement to the soil to get the leaves dark enough. The flowers are not as large and showy as other passionflowers. They are solid yellow and look like numerous stars on the passionflower vine. Before they open and after they close, they look like yellow candles, and are still decorative (each passion flower opens for only a day). They are freely produced year round and are a joy to look at! Passiflora citrina originates from Central America, and can tolerate lower temperatures for short periods of time. When grown as a house plant, it’s evergreen and everblooming. This passionflower is small and compact, very easy to take care of, and very forgiving of neglect. And given suitable conditions it will constantly bear flowers. Though the flowers are not big and showy, they are lovely to look at and so numerous, when the plant is grow well, that it’s quite a sight. Passiflora citrina has medium watering needs. In my experience it handles drying out and over watering quite well. When the plant is dried out it seems to drop leaves instead of wilting, and when overwatered the leaves get paler and the soil gets washed off from nutrients. Overall a very forgiving plant. Water generously when the soil feels dry to the touch and use a well draining medium for best results. In my experience Passiflora citrina prefers part shade over full sun. You can grow it on east/south or west window inside, but if taking it outside for the summer, it will prefer part shade. This plant will flower with lower light level as well, but it will not do well on a north window. Passilora citrina is not as fussy s other passionflowers, and can tolerate lower humidity levels quite well. It’s also quite resistant to bugs. When the humidity is really low, the leaves become more brittle, so for best results keep the humidity higher. Rich well draining medium is perfect for this plant. You can use a generic potting mix with slow release fertilizer and some sand or per-lite. I like to add a bit of compost to my mixture, and it seems to give the extra richness to the soil. Generic fertilizer will do just fine. I would say this plant is a moderate feeder, though not as much as some of the more showy passifloras, so be careful not to over-fertilize. Just like other passifloras, Passiflora citrina is very easy to propagate through cuttings. I’ve successfully rooted cutting any time of the year and any type of cutting would work. The plant grows rapidly, and reaches blooming size in half a year or less depending on the conditions. As a rapid growing vine, this plant requires support. Feel free to cut back loose growth and wrap the plant and shape it however you like. To have a nice dark foliage it helps to add a bit of slow release iron granules to the soil, and ensure the plant is getting plenty of light. Passiflora citrina doesn’t require as much light as other passionflowers, and can be grown successfully at lower light levels, as well as under grow lights (daylgiht LED works just fine if you provide enough lux to the plant). Very easy plant to grow, and a generous bloomer, this passiflora makes a wonderful houseplant! Columnea ‘Melissa’ is a wonderful plant to have at home. It has large showy flowers, that surprisingly last for a very long time. The leaves are small and darker somewhat variegated at the edges and redder on the bottom side. The flowers are large, bight orange with yellow throat and darker red lines. They look very similar to Columnea ‘Lava flow’, another everblooming columnea. Columneas are generally seasonal bloomers, but a lot of hybrids and cultivars are available that bloom constantly and heavily. Some columneas are cascading with softer stems, other grow more shrubby and have more rigid stems and upright habit. Some have tiny leaves, other large, some are hairy others glossy and so on. The flowers range from yellow, orange, red, and any type of marking in between, some cultivars have pink flowers. The strange shape of the flowers are why those plants are commonly called “flying goldfish plant”, “dancing dolphins” or “shark plant”. On general columneas are epiphytic plants, and like orchids, require very well draining , open medium, higher humidity, and like to be kept lightly moist with very slight drying out between watering. Some varieties are more tolerant to drying out. They generally prefer warm environment, though some are high altitude plants that require lower temperatures. The seasonal bloomers sometimes require colder periods of time to promote blooming. Columnea ‘Melissa’ is an excellent hybrid, very easy to grow, and starts blooming very early and profusely. 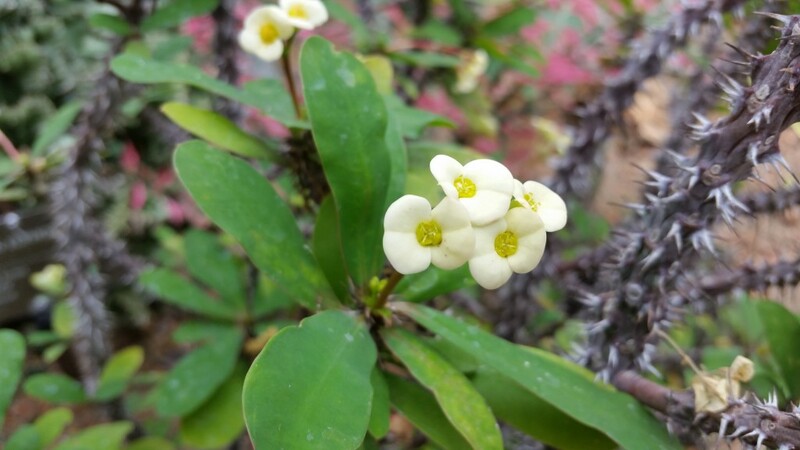 It has somewhat more rigid stems medium sized leaves and very large flowers. It’s quite tolerant of a bit of neglect, and if grown from cutting, it takes only a few months to have it start blooming. Medium watering needs. Allow the plant to slightly dry out between watering it in the winter, and try to keep it evenly and lightly moist during the summer. Grows wonderfully with hygrolon strip though the medium to keep constant moisture in the soil without letting it get soggy. If you overdry out plant, don’t overwater it right after (though usually that’s fine for other pants), as it most likely will rot your columnea, rather water it slightly and slightly increase the watering. Part shade, though it can take higher light if slowly accustomed to it. You can grow this plant on south/west/east window and even a north window, though it will reduce the flowering and make the growth leggy. Allow for plenty of light to get the maximum out of your plant. You can also grow under artificial light. Columnea ‘Melissa’ is not very needy as some other columneas, or columea species. It can tolerate lower humidity. Don’t directly spray the leaves though to avoid wilt spots. Humidity trays will help you plant look its best. Very low humidity will make your leaves dry at the edges. Make sure your soil is very well drained. I sometimes add orchid potting mix (little chunks of wood) to the bottom of the pot, and a bit throughout the medium, quite a bit of per-lite, and either african violet soil or peat moss and maybe a bit of regular soil. Columneas don’t mid underpotting, and they seem to flower more when potbound. I use african violet fertilizer, though orchid fertilizer might work just as well. Fertilize more during spring and summer when the plant is growing rapidly. Columnea ‘Melissa’ is quite a rapid grower. Colmuneas are very easy to propagate though cuttings. I root the cuttings in moist soil and an enclosed environment to keep the humidity high (either a glass bowl, in a ziplock bag, or a pot wrapped with a plastic bag). Make sure you don’t over dry your plant as recovery will be difficult. Trimming will help maintain shape and create a fuller specimen. Columnea ‘Melissa’ is a wonderful plant to have. It will be perfect for hanging baskets, even though it has more of a bushy growth habit. Very easy and fun to propagate, since it starts blooming almost right away. I highly recommend it! The flowers are quite spectacular and numerous, and it makes for quite a display!